This set of Molecular Biology Interview Questions and Answers focuses on “Various Classes of RNA Have Different Functions – 2”. Explanation: All tRNA has a conserved sequence of 3’ ACC 5’. This sequence is conserved so as to facilitate cognate amino acid binding. Explanation: Some unusual bases are present in the tRNA for its improved functioning. One of such pos – transcriptional modification done enzymatically is the presence of thymine base in place of uracil in the primary structure. 3. With respect to tRNA which of the following is not its characteristic? Explanation: The complementary region enables the tRNA to form limited stretches of double helix held together by base pairing. The other stretches of the tRNA are non – complementary thus remain single stranded as loops. Thus the tRNA is a mixture of single and double stranded regions represented by the clover leaf model. 4. How many loops are present in the clover leaf model of tRNA? Explanation: There are 4 loops and an acceptor stem in the clover leaf model of tRNA. The names of the 4 loops are ΨU loop, D loop, anticodon loop and the variable loop. 5. Why the variable loop is named so? Explanation: The variable loop sits between the anticodon loop and the ΨU loop and its region is fixed. The name is so given because they vary in size from 3 to 21 bases. Explanation: X – ray crystallography reveals the tRNA has an L – shaped tertiary structure. In this structure the amino acid binding site o acceptor site is approximately 70 Å away from the anticodon site residing on the opposite end of the structure. 7. What is the angle between the D loop and the anticodon loop? Explanation: The X – ray crystallography shows that the D loop and the ΨU loop comes together making the anticodon loop an extended helix. These to helices align at right angle, that is, 90˚ to each other in their tertiary structure. 8. Which of the following does not contribute to the stability of tRNA? Explanation: Due to the negative charge of the tRNA backbone, it is unlikely for the molecule to have a hydrophobic nature. Thus, hydrophobic interactions do not play any role in the structural stability of the molecule. On the other hand, the other interactions such as the hydrogen bonding leads to base pairing which leads to its classic clover leaf model. 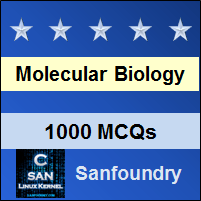 To practice all areas of Molecular Biology for Interviews, here is complete set of 1000+ Multiple Choice Questions and Answers.